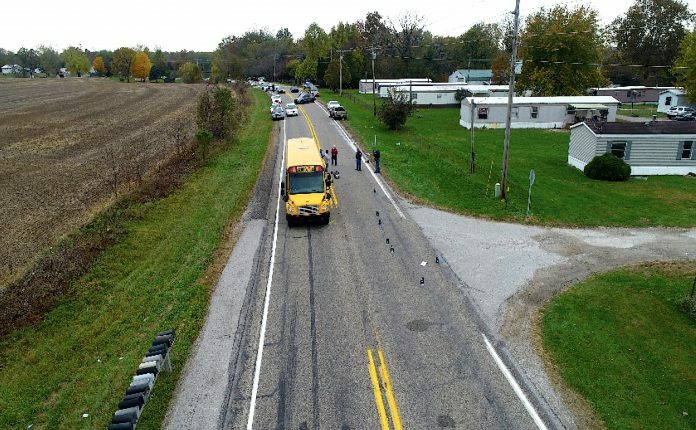 The NTSB has released its preliminary investigative report—but with no definitive probable cause—on the deaths of three Indiana siblings who were killed in October by a motorist who illegally passed the children’s waiting school bus. 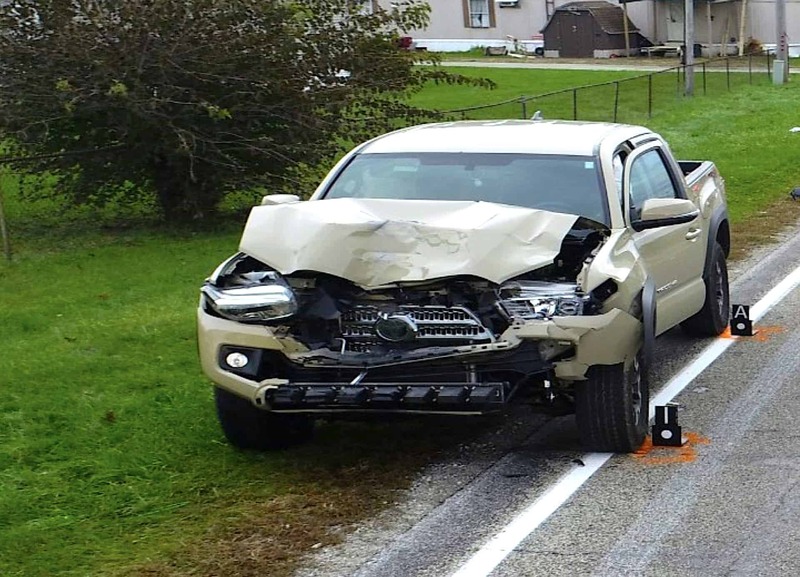 The crash-involved pickup truck that struck students crossing SR-25 in Indiana. (Source: Fulton County Sheriff’s Office). The preliminary report released on Wednesday recounts that on Oct. 30, a Thomas Built school bus stopped to pick up students at the designated location in Rochester, Indiana, along State Route 25. The time was about 7:12 a.m. local time, approx. one hour before sunrise. According to the report, a pickup truck that was being driven in the opposite direction struck four children who were crossing the roadway. Alivia Stahl, 9, and her twin step-brothers Xzavier and Mason Ingle, 6, were killed at the scene. The other student, Mason Lowe, 11, was critically injured. The preliminary report also stated the occupants of the school bus were uninjured in the crash. NTSB investigators said the school bus had its red warning lights flashing and federally mandated stop arm deployed at the time of the incident. The roadway is described as a two-lane highway with a posted speed limit of 55 mph. The report stated there is no roadway lighting at this location, but “Watch for School Bus” and “Left Curve” warning signs are posted southbound on SR-25. Lowe was transported by helicopter to a medical facility in Fort Wayne, Indiana for treatment. He recently met the medical team that kept him alive during transport. NTSB also is investigating two other school bus stop fatalities that took place around the same time. On Oct. 25, two brothers were hit by a car in Hartsfield, Georgia, as they also crossed the street to their school bus in early morning darkness. According to the report, that school bus had its warning lights on and the driver had deployed the stop arm. Ten-year-old Noah Palmer died from his injuries, while his brother, Dylan Palmer, 7, suffered serious injuries and was transported by air ambulance. The other incident NTSB announced it was investigating occurred on Oct. 31 in Baldwyn, Mississippi. A school bus had stopped to pick up students at the designated location, when a pickup truck struck a child who was crossing the highway, again in early morning darkness. Like in the other incidents, the school bus had its warning lights flashing and the stop arm deployed. Dalen Thomas, 9, was airlifted to Bonheur Children’s Hospital, where he was later pronounced dead. The posted speed limits in both Georgia and Mississippi were also 55 mph, and all of the children were crossing the highways before 7:30 a.m. According to data School Transportation News has complied from local news reports since last August, one dozen students have been killed so far this school year at school bus stops while loading or unloading their school bus. This is double the number of reported fatalities at school bus stops that were reported for the last school year. In addition to the 12 killed, 44 students were injured at school bus stops. NTSB is expected to release its final investigative report on the three incidents next year.